We have just the right plastic poly mailer to fit your need. 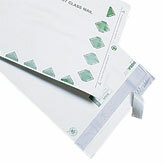 We also offer custom printed lip and tape poly mailer bags. 1|2|3|4|5|6|7|84%22|5%22|6%22|6.5%22|6.75%22|7.25%22|7.5%22|8.5%22|9%22|9.5%22|10%22|10.5%22|11%22|12%22|12.5%22|13%22|14%22|14.25%22|14.5%22|15%22|19%22|20%22|24%22|26%228%22|9%22|10%22|10.5%22|12%22|13%22|14.5%22|15.5%22|16%22|17%22|19%22|20%22|24%22|28%22|33%22|36%22|39%22|45%222%22|4%22|5%22 Select a Category12345678 Width4"5"6"6.5"6.75"7.25"7.5"8.5"9"9.5"10"10.5"11"12"12.5"13"14"14.25"14.5"15"19"20"24"26" Length8"9"10"10.5"12"13"14.5"15.5"16"17"19"20"24"28"33"36"39"45" Bottom Gusset2"4"5"